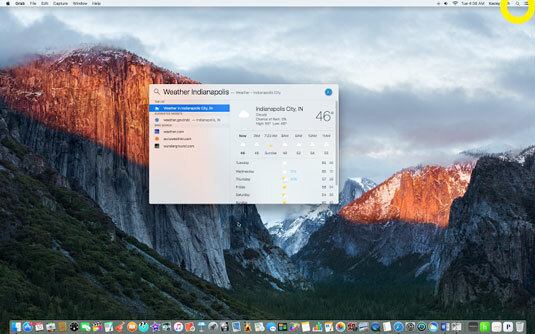 OS X El Capitan is essentially the same operating system as OS X Yosemite but includes minor bug fixes, improved performance and security, better language support, as well as a few feature enhancements. OS X El Capitan is the eleventh major release of OS X. This new release is offered as a free upgrade through the Mac App Store application found on your Apple computer. If your Apple Computer has no Mac App Store (pre-10.6.8) or is running a 32-bit graphics card or 32-bit processor (pre-2007), OS X El Capitan will not be compatible with your computer. Find cursor: If you have a lot of windows open, busy wallpaper, or multiple monitors, then finding your cursor is not always an easy task. 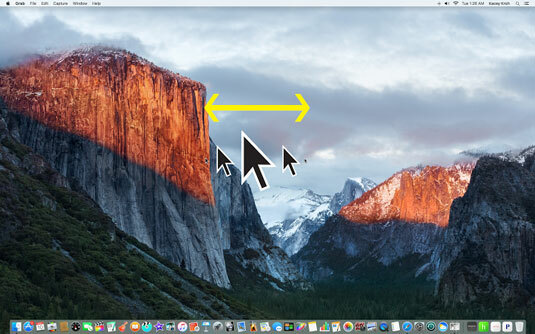 To find your cursor more easily, El Capitan offers the capability to magnify the cursor briefly when you wiggle it back and forth. The magnify action can be executed with the shake of your mouse or by wiggling one finger on your touchpad. AirPlay integration: AirPlay been improved upon in iTunes and is now included in QuickTime and Safari. This means you can throw content not found in your iTunes libraries as well as content you discover online to an AirPlay-capable device such as an Apple TV. 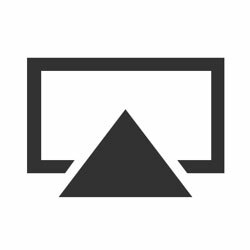 Once you find some desired music, photos, and videos to throw locate and click on the AirPlay symbol integrated into iTunes, QuickTime, or Safari and select the device to which you wish to throw the content. 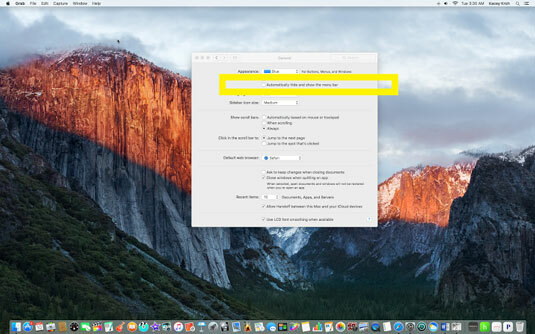 Auto-hide menu bar: If screen real estate is important to you or you don’t like the look of an “always there” menu bar, you can change the way OS X behaves by setting the menu bar to auto-hide just like the dock. This option leaves a full desktop area from which to work. A great feature if you are someone easily distracted by clutter! Find My Friends widget: The Find My Friends app that is included in iOS is now integrated into OS X via a widget you can add to your notifications pane. This widget shows you where friends, family, and colleagues are located provided they use the iOS and OS X Find My Friends app/widget as well. Adding the Find My Friends widget to your notifications pane is simple. Click on the three dashes in the top right corner. The notification pane will slide out, at the bottom select “Edit.” You will be presented with a list of widgets to add to your notification pane. Locate Find My Friends and click on the green plus sign associated with the widget. Click to allow location services access, and you’re done. Adding the Find My Friends widget to your notifications pane is simple. Improved Spotlight search: Spotlight includes improved search results, integrated weather, stocks, and web content. A Siri of sorts for OS X, the spotlight box now can be moved around and resized for your convenience. To launch Spotlight click on the magnifying glass icon in the top right corner of your menu bar. Type in your question, request, or keyword and watch the Spotlight application do its magic. 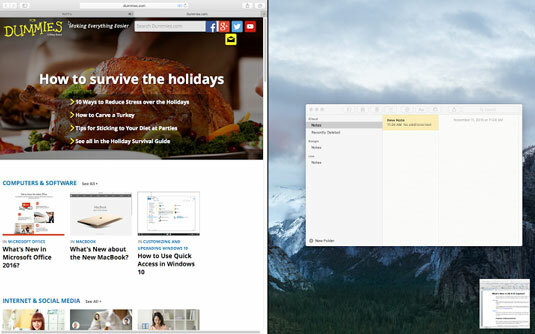 Split View: A feature that has been around on Windows since Windows 7, OS X finally has the capability to “snap” two windows to your screen to maximize your screen real estate and workflow. Open two or more applications that have full-screen/split-screen support (all built-in applications are supported as well as some third-party applications provided you updated them after your upgrade.) After you have two or more applications open, click and hold the green button in the top-left corner to activate the Split View function. The application will fill half the screen and a list of applications will display as options to fill the second half of the screen. Chose the application you want to snap into the second half of the screen. 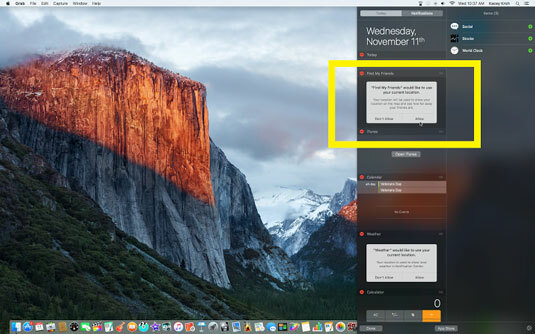 Performing the split-screen function on two supported applications is easy.